More and more webmasters are becoming disillusioned with contextual ads. Payouts have become smaller and smaller over time. Unless you've got a really good niche, you're probably finding that most of your clicks are now paying just a few cents. The result is an ever-decreasing income from your website. How about putting your own ads on your own web pages instead? You can then advertise your own products, your newsletter or any affiliate program. You can set up as many ads as you want. Your website will show ads wherever you specify (as many ads per page as you want) -showing all your ads in a continual rotating cycle. The software will show you exactly what the ad looks like, allowing you to tweak it until you are 100% happy with it. 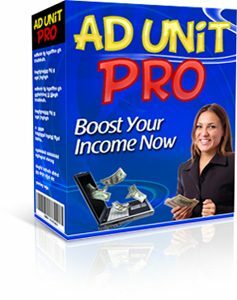 Ad Unit Pro offers a quick and easy way to monitor all your ads. You can edit ads, delete ads and create new ads at any time. This gives you a quick and easy way to monitor your ad performance and fine-tune your ads for maximum profit. You can install the Ad Unit Pro script on as many websites as you want (as long as they are all owned by you). You can install one copy of the script for each website - or if you prefer, you can install a single copy of the script and use it for all your websites (you can specify which website each ad will appear on).